Trudging through these wasted times, true metal warriors seldom hear war hymns that truly inspire or paint vivid pictures of glory and death. SOLITARY SABRED unsheathe their valiant sonic steel and wield it once again in the sophomore full length “Redemption Through Force”. The Cyprus metal warriors bring forth an amazing experience of U.S. epic/power metal for listeners to behold. “Redemption Through Force” presents “an ambitious part historic-part fiction concept, telling the tale of Jacob Cramer, an ex-crusader on a self-righteous path to vanquish all evil, putting his own sanctity at risk in the process” according to the band’s Facebook page. SOLITARY SABRED deliver such solid and comprehensive metal experience within the 11 song release. Intro track “Synaxxis of Honor” is a hybrid of spoken word prefacing combined with a grand backing soundtrack of acoustic guitars, clashing blades and wailing high octave vocals. Thus begins the sonic journey of this epic release with superb balance of guitar, rhythm, and vocal structuring. Also, thus begins the battering of Petros "Asgardlord" Leptos’ vocal barrage, covering the entire tonal spectrum and piercing the soul with glass-cracking shrieks. The intro is a sign of great things to come both musically and thematically. “Disciples of the Sword” kicks in with drum battery and the memorable chorus hook of no quarter given and none requested. It is easy to draw parallels between SOLITARY SABRED and other notable power/progressive metal bands like ICED EARTH and FIREWIND. Familiar song structuring and vocal layering fits perfectly within the genre and Antreas Tapa provides an unshakable backbone. All cylinders fire in this metal onslaught with ripping guitar solos, booming gang vocals, and shrill vibrato vocal lines chanting the song’s title until finish. There exists a strong presence of capacity and full sound without overpowered volume levels and distortion. “Stigmata of Pain” moves forward with chugging bass drum combinations in conjunction with heavy guitar riffing. A haunting guitar melody mixes with the verse lines in build up to the evil chorus. This does well to continue the theatrics of the album theme and screams into up tempo riffing and double pedal. Ominous guitar solos pull back the reigns and return the track to the heavy chorus. Pure metal majesty! An amazing thing happens next in “Transgression” when the listener takes part in the redemption of heathen sins at the hands of the noble holy warrior. We hear the breath escape from empty lungs while exalting words travel with them to the afterlife. A truly noble act in the name of god or the execution of an innocent soul? We’ll never know, but it’s shaking vivid imagery of the storyline and one of the most metal transition tracks ever! Along with “Resurrectio Animi” SOLITARY SABRED display agility in building the album net worth using multiple types of dynamics. “Redeemer” blasts off with lead shredding and more encompassing vocals. This track is the best display of all out metal fury within the album. An amazing vocal hook in the chorus leads the charge. Songs “Burn Magic, Black Magic” and “Sarah Lancaster (the witch’s breed)” hold the listeners attention like red hot forceps. Throughout the album there is no lack of creativity within a predetermined format and structure. The licks aren’t tired and bright guitar work in contrast with heavy riffing drives the music home like a long sword straight through the heart. The tail end of this beast has strong scales and dark intentions. Throughout the album the melancholy grows and we hear the dichotomy of good and evil, righteous and malevolent, noble and wicked. By the end of the album they operate as one comprehensive full sonic experience. 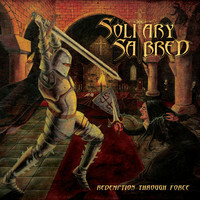 SOLITARY SABRED have done what countless other warriors tried and failed in the form of a momentous epic metal album “Redemption Through Force” with no shortcomings and even less room for the weak hearted.